Love them or hate them, Hanson is pretty good for business. The pop-rock band's free performance at Central New York's fourth annual First Night celebration will draw visitors from as far as Michigan and Nova Scotia for New Year's Eve. Even though it's the band they're coming to see, they'll be staying in our hotels, checking out our malls and eating at our restaurants. Krista MacKenzie of Nova Scotia drove 15 hours on Sunday, December 29 to seeHanson ring in 2014 in Onondaga Lake Park. Before New Year's Eve, MacKenzie, her sister and her two friends (also Hanson fans) look forward to exploring Destiny USA today, December 30. 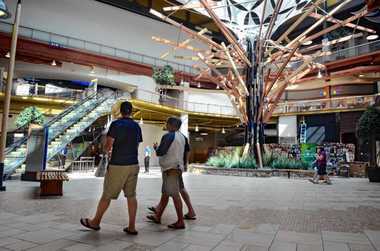 "We certainly don't have malls of that size anywhere close to here," said MacKenzie, 28. MacKenzie, an elementary school teacher, has seen the band perform live 27 times. She has a friend who has seen the band perform live more than 400 times. MacKenzie's sister isn't a fan, and First Night will be her first time seeing Hanson. "I'm excited to be able to share my ultimate happy place with her," MacKenzie said. After Syracuse, MacKenzie will drive home to Nova Scotia for a few days, before flying to Negril, Jamaica to see Hanson again. On December 31, Margo Baetens will drive six hours straight from Detroit, Mich. to Syracuse to see the band as well. A Hanson fan since 1997, First Night will be the 73rd time for Baetens to see the band perform live. She's been attending their performances since 2003. "Every show is different," said Baetens, a 29-year-old film entertainment publicist. "There's a lot of friends I've made because of the band, so every concert is like a reunion." This won't be the furthest Baetens has traveled to see Hanson. She once drove 14 hours to their concert in Oklahoma City. In 2004, she and her friends spent three weeks following the band on tour. "We used to camp out so we could be the first in line," Baetens said. "It's so funny how different it is now that we're older. Now we stay in hotels." She will also fly to Jamaica to see the band again next month. Hanson rose to stardom and heartthrob status when their debut album "Middle of Nowhere" topped pop music charts in 1997. Brothers Isaac, Taylor and Zac Hanson will perform their hit single "MMMBop" at First Night and several original songs. Last year, First Night brought more than 8,800 people to Onondaga Lake Park. This year's alcohol-free event will end with an "orange ball drop" at midnight and fireworks. Where: The Wegman's Landing section of Onondaga Lake Park in Liverpool. When: Tuesday, Dec. 31 at 7 p.m.
How much: Free. Find parking in the Village of Liverpool, or park at Destiny USA and take the shuttle to the park for free.